A velvety fan of deep autmunal-brown, aniseed-scented gills…. What a find to get back onto my forager’s feet! 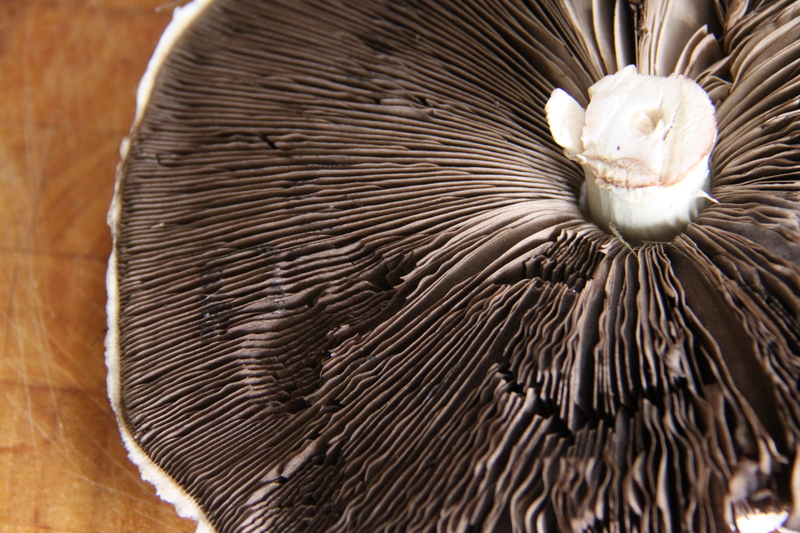 Horse Mushrooms are among the very best of all edible fungi, and perhaps indeed among all foraged food. I place them second only to The Prince when it comes to mushrooms, and they are so deliciously sweet and meaty that only Lobsters and Brown Crabs hold the trump cards over the rest of the forager’s menu – seriously, they’re that good. 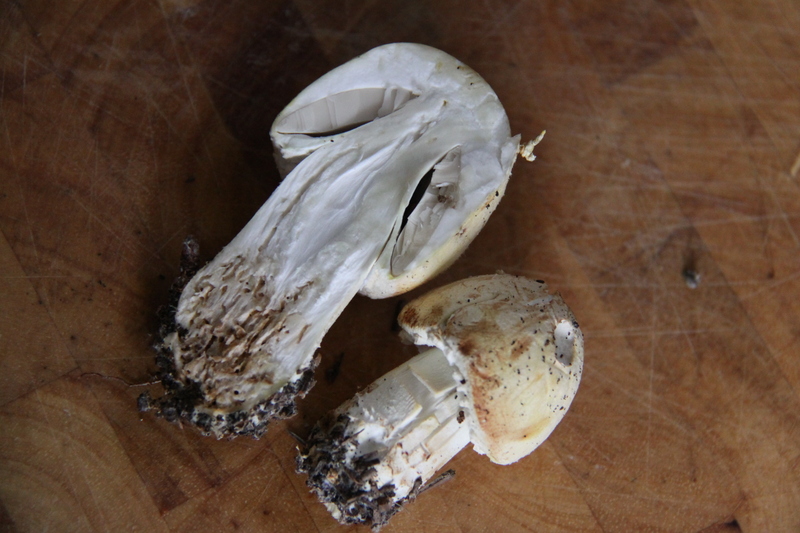 The cut stem base of the Yellow Stainer (left) stains yellow, whereas the Horse Mushroom (right) does not. Notice the gills on the sliced mushroom. When very young the Horse Mushroom has pale cream/off-white gills. These soon turn a pale pink colour before becoming dark brown. 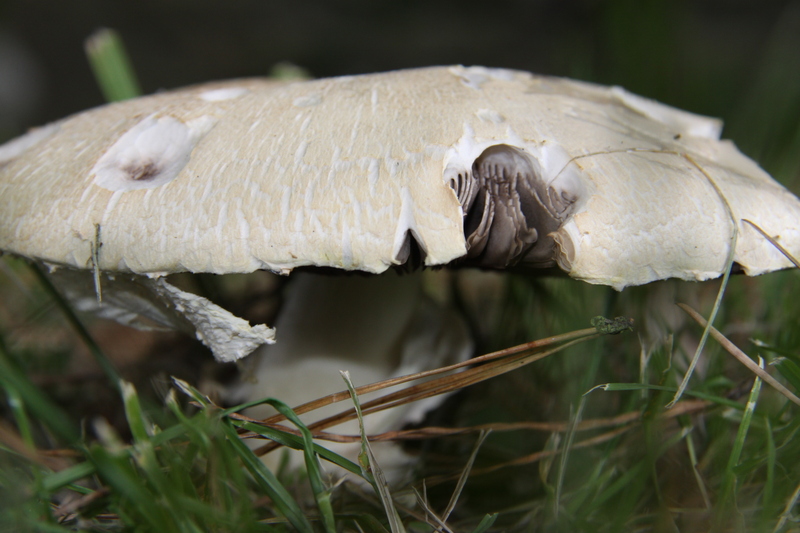 Horse Mushrooms have a very unfortunate look-alike, which itself is the most common cause of mushroom poisoning in the UK – the Yellow Stainer. It is imperative, therefore, to learn both of these mushrooms, or else what you thought was going to be your most pleasing dish of autumn, might well be your last (well, to be fair, the Yellow Stainer is not actually a killer, but the effects of consumption could well be enough to put you off mushrooms for life). Both of these mushrooms stain yellow upon bruising, though the Yellow Stainer more vibrantly so. After a few minutes, however, the yellow seen in the Yellow Stainer fades to brown, whereas it persists in the Horse Mushroom. 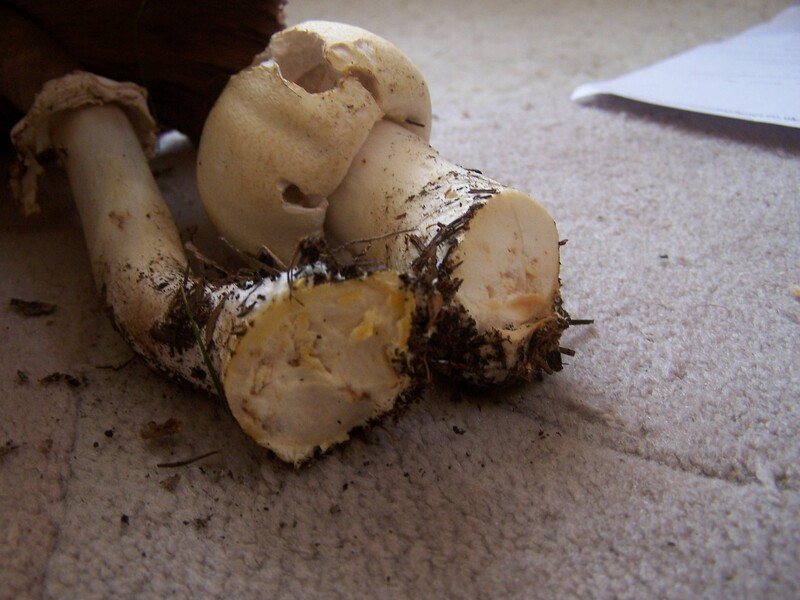 What the Horse Mushroom does not do, though, is stain yellow when cut through the base of the stem – the absolute distinguishing feature of The Yellow Stainer. So, if you remember nothing else, then remember this: Always ensure that your Horse Mushrooms do not stain yellow at the base of the stem. See my Edible Mushrooms A-Z page for for further pictures and description, and also my Spore Print Gallery to see the Horse Mushroom’s spores. Inky, sweet, pungent with a heady aniseed aroma – I advise that you do as little with mature, open-capped specimens as possible: brush with melted butter, sprinkle with salt and a little pepper, and bake under a hot grill. I wouldn’t even be tempted to use garlic oil or a squeeze of lemon – especially if it is your first one: you don’t want anything to infringe upon the Horse Mushroom’s intense flavour and melting texture. I promise you, when those inky-black juices lather over your tongue, you’d be forgiven for thinking that you were biting into a hot rare slab of sirloin. Exquisite. Younger specimens, though still sweet, lack the gusto of their older brethren, and can be used as you would any other mushroom. 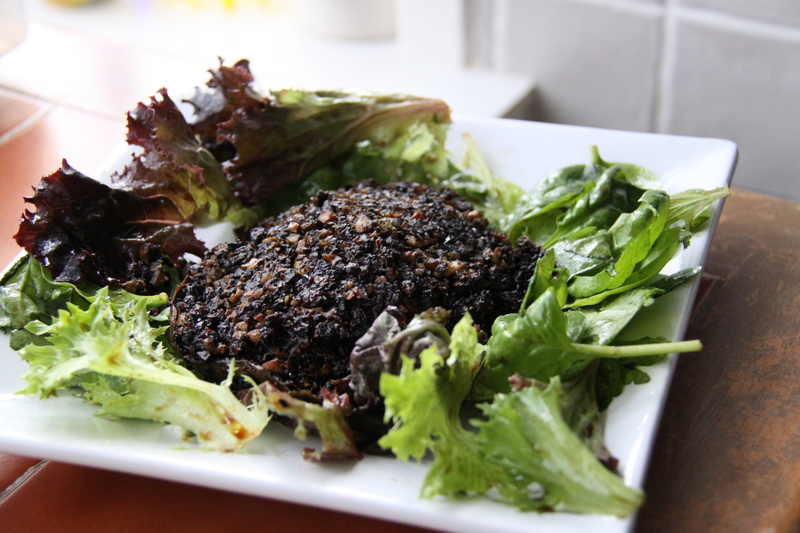 I managed to collect both young and old on my travels, and so came up with a recipe that combines both: Baked Horse Mushroom Stuffed with Mushroomy Tapenade. Enjoy. This entry was posted in Mushrooms and tagged cooking, edible fungi, family activities, food, Food For Free, foraging, free food, horse mushroom, Horse Mushrooms, Identifying wild mushrooms, poisonous mushrooms, Taking a spore print, The Great Outdoors, The Yellow Stainer, wild food, wild mushrooms. Bookmark the permalink. Thank u for this info, and I have been successful with the red lobster mushroom so far but there many other different mushrooms. So I have this one on my side of DO know but I am sure glad I looked into the horse mushrooms as LOOKS can be deceiving although I have smelled, tasted and spit out and actually I fried and ate the horse mushroom in past week or two but today I must say I feel that I did ingest and that I was WRONG. Although my tummy is gassy and I am a little light headed, I now see that ANY yellowish or funky odor just DO NOT eat it is not worth the meal. As it is only a mushroom and not the only food on earth. SO everyone please be careful and as for me I will stay away from horse mushrooms until I further learn MORE. Again thank u as I have been through many sites and after 20 or more your info brought me to a halt and so did my tummy, again sweet thanks!!! No worries – always best to be safe rather than sorry when it comes to foraging, because you can end up very very sorry indeed.